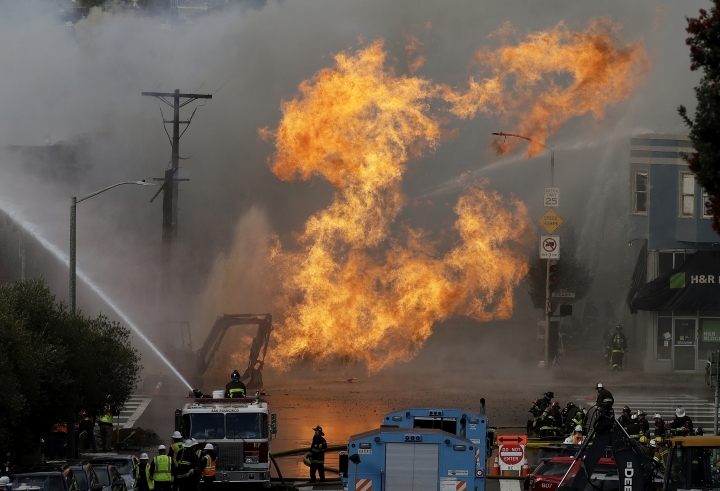 Utility crews had to hand dig underground to shut off gas flowing to a fire that raged in a San Francisco neighborhood. A spokeswoman for Pacific Gas & Electric, Melissa Subbotin, says that's why it took more than two hours to shut off the gas that fed the flames Wednesday. Subbotin says crews were able to "squeeze" a 4-inch (10-centimeter) plastic gas line to eventually turn off the flow. She says crews also used a manual shut-off. She says PG&E had to weigh the risk of shutting off a bigger transmission line, which could have turned off gas to the entire city of San Francisco on a relatively cold day. PG&E says about 300 gas customers are without service and about 2,500 are without electricity. Officials say a fire that ripped into a San Francisco restaurant building after a gas explosion is extinguished. Witnesses living near the explosion said the windows in their apartment started rattling Wednesday and they looked up to see shooting flames reflected in the glass. Caroline Gasparini said she and her housemate grabbed their shoes, laptops and passports and fled. Gasparini said they saw employees of the burning Chinese dim sum restaurant run out the backdoor of the building. They saw children at a nearby preschool preparing to leave. She said people were running down the block before the official evacuation. 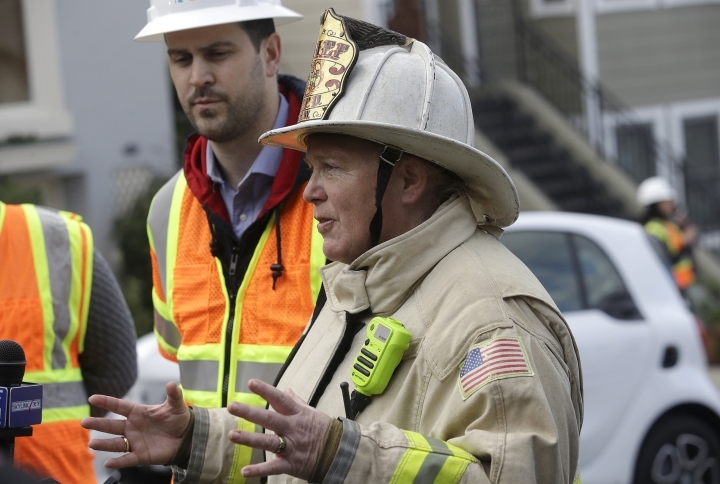 Fire Chief Joanne Hayes-White says workers for a private contractor cut a natural gas line while installing fiber-optic wires at a business. San Francisco's fire chief says a gas explosion and flames have ignited five buildings in a neighborhood. Pacific Gas & Electric spokesman Patrick Doherty says crews are working as quickly as possible to turn off gas that's feeding the flames. Hayes-White says the fire in the city's Richmond neighborhood was reported about 1:20 p.m. Wednesday. 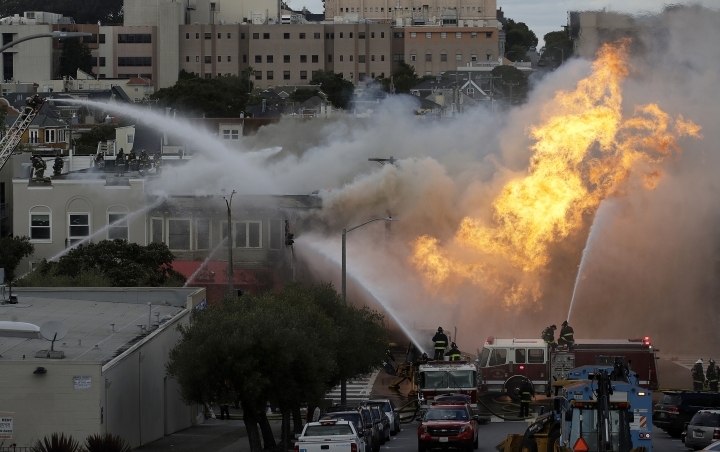 The San Francisco Fire Department says five workers have been found safe after a gas explosion and fire and that no injuries have been reported. Three-story flames in a neighborhood could be seen leaping into the air Wednesday in television images. Fire Chief Joanne Hayes-White says workers installing fiber-optic wires at a business cut a natural gas line. She says Pacific Gas & Electric has responded to try to stop the flow of gas. The San Francisco Fire Department says five workers are missing following an explosion and fire on a gas line in the city's Richmond neighborhood. Three-story flames could be seen leaping into the air in television images. Police spokesman Robert Rueca says the fire was reported around 1:10 p.m.
KPIX-TV reported that the fire started at a construction site. San Francisco police have closed off neighboring streets. An explosion on a gas line has set at least one San Francisco building on fire and is sending huge plumes of fire and smoke into the air, prompting evacuations of nearby buildings. Three-story flames could be seen leaping into the air in television images. Police spokesman Robert Rueca says the fire was reported around 1:10 p.m. and there were no immediate reports of injuries. San Francisco police have asked people in nearby buildings to evacuate and have closed neighboring streets in the Richmond District. Augustine Ruiz, a spokesman for the United States Postal Service, says a post office nearby was evacuated. He says the fire did not originate from the post office.